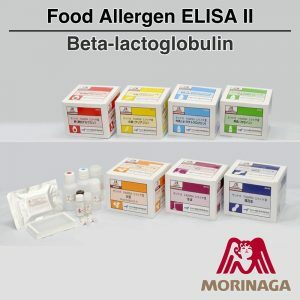 Morinaga Food Allergen ELISA II for Beta-lactoglobulin are sandwich enzyme immunoassays for the quantitative determination of individual proteins of allergic ingredients in processed or unprocessed food. 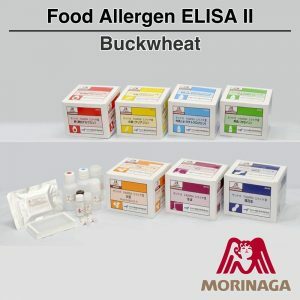 Morinaga Food Allergen ELISA II for Buckwheat are sandwich enzyme immunoassays for the quantitative determination of individual proteins of allergic ingredients in processed or unprocessed food. Morinaga Food Allergen ELISA II for Casein are sandwich enzyme immunoassays for the quantitative determination of individual proteins of allergic ingredients in processed or unprocessed food. Morinaga Food Allergen ELISA II for Egg (Ovalbumin) are sandwich enzyme immunoassays for the quantitative determination of individual proteins of allergic ingredients in processed or unprocessed food. Morinaga Food Allergen ELISA II for Peanut are sandwich enzyme immunoassays for the quantitative determination of individual proteins of allergic ingredients in processed or unprocessed food. These Morinaga Food Allergen ELISA II for Soya kits are sandwich enzyme immunoassays for the quantitative determination of individual proteins of allergic ingredients in processed or unprocessed food. Morinaga Food Allergen ELISA II for Wheat / Gluten (Gliadin) are sandwich enzyme immunoassays for the quantitative determination of individual proteins of allergic ingredients in processed or unprocessed food.